Submitted by Kevin Dickerson on 28 January 2019. Please tune into my LIVE PolarConnect event on February 6th, 1:30pm Utah Time. Easy to follow instructions are found on our PolarTREC webpage. Today was a no-fly day so we had some extra lab time. 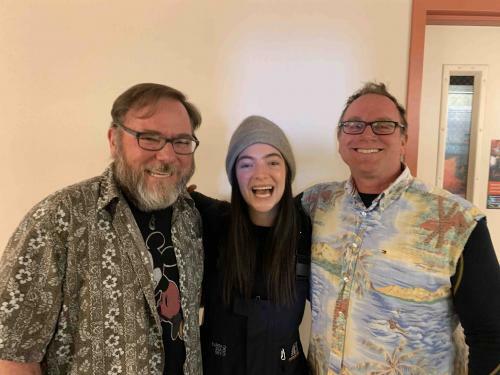 That turned out to be an okay thing because we were paid a visit at our lab by New Zealand's famous singer-songwriter Lorde. She was super interested in our work. She took a look at the animals we are studying under the microscope and was very excited with what she saw. She visited with us until finally, those who were escorting her around said she was late for another stop she needed to make. She stayed and chatted even longer after that. The environment is lucky to have famous people like her taking an interest in getting the real facts, the science, of what is really happening to our Earth. She was so interested as Dr. Adams expressed his concern to get this science right. What is being done here, by this LTER Project, could have implications that could lead to the Earth's future conditions. Lorde seemed sincerely interested in this work. Dr. Michael Gooseff (lead P.I. for the McMurdo Dry Valley LTER Project, Lorde, Dr. Byron Adams P.I. for the Soil Team for the Dry Valley LTER. We had a great tour of the Scott Discovery Hut. Wormherders at Scott's Discovery Hut. A video of this amazing tour is coming. 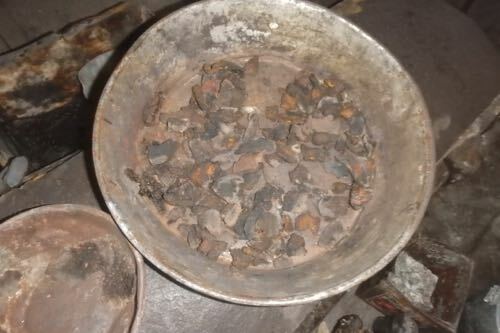 This is seal blubber, still in their frying pan on the stove. The men using this hut must have been in a real hurry to leave. Here is a time warp video of my run from my dorm up Observation Hill and back. There is also a brief tour of McMurdo Station. Kevin! I glad that you got to visit Scott's Hut. That looks like Michelle O'Leary there in your picture, did she give you the tour? She has a great story and was a great tour guide for my team! 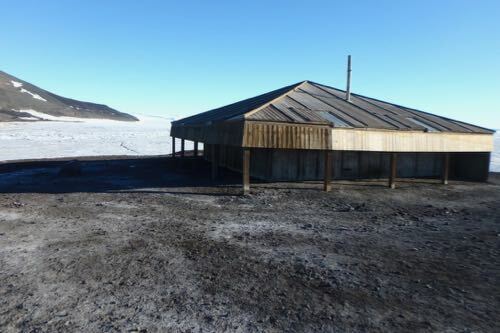 Can you imagine being stuck in that hut for a cold and dark 6 month winter!? Hi Mike. Yep, it was Michelle. She has taken real good care of our team also. She did a great job as our guide. Dr. Byron Adams, of team Wormherder, also added to the tour with his knowledge. This is his 17th year here. In fact, he's the Sunday Science presenter tonight in the galley. I plan to tape his entire presentation. No, I can't imagine living in there with 10 dudes. Now I know why those poor guys faces were always black. Not from the weather or sunburn, but from being in that small hut with soot from burning seal blubber all winter. How would you have felt if you were the poor soul who messed up and let their ship slip away without them on it. You're welcome. It's been a fun thing trying to sum up the day in one short journal. I have heard that my site has been getting a few more hits once word got out that Lorde visited us. It was great to see her sincere interest in the science being done here. It is so cool that celebrities like Lorde are taking interest in subjects like this one, even going and touring the facilities! That is super cool! Hi Ryatt. Yep, it was great seeing her, the high up military leaders, and other VIP's coming through our lab and developing real interests in the science going on in Antarctica. 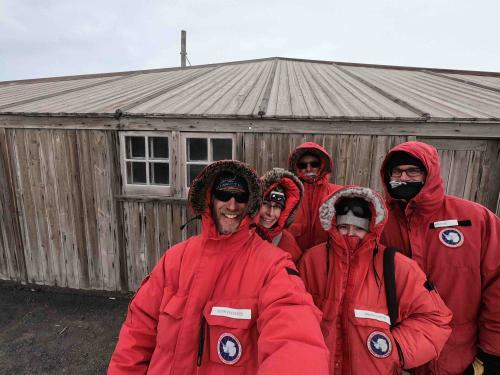 Location: Scott's Discovery Hut, Ross Island, near the McMurdo Science Station.